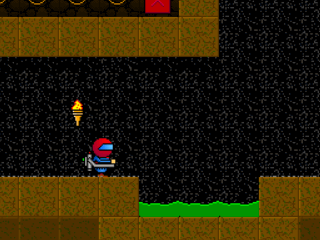 Dark Caves is based on a Commodore 64 game, which almost automatically scores points with me. Although I have not played the original game, this one actually reminds me a lot of another Commodore 64 game called H.E.R.O. You fly through caves collecting treasures, fuel for your jetpack, and bombs to break through obstacles. The action is straightforward, the graphics are nice and polished, and the sound effects do their job well. Dark Caves is a simple, short, well-crafted platform action game. And if you like this one, you're sure to also like the sequel, Dark Caves 2. Recommendations: The 2 people who like Dark Caves also like the following games. One of the best games of gamemaker! EXCELENT MOST SPIFF-O-TASTIC GAME EVAAH!! !sweet simple, but excelent getting ready to play #2. MAKE MORE PLEASE!!! OK.That was easy I beat in like 4 seconds it was so easy I wanted to make it myself but,nice work. The name for this game has been used before in a very rare and old Apogee game!